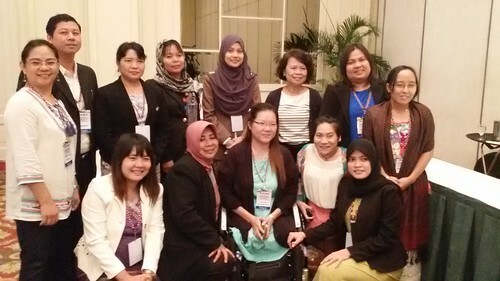 The Autism Society Philippines was a participant at the “Training the Trainers on the Development and Management of Comprehensive Programs for PWDs in the ASEAN Region” conference held from 28 to 30 October 2014. The society was represented by Maria Joyla N. Ofrecia, M.A. SPED (President, ASP CSFP Chapter) and Anawi Tolentino, M.D. (President, ASP Hagonoy Chapter). This event is Phase 2 of the project “ASEAN Conference on Program Evaluation for Persons with Disabilities” which was proposed and endorsed during the 5th ASEAN Senior Officials Meeting on Social Welfare and Development (SOMSWD) last December 2008 in Manila, Philippines and has a funding support from Japan ASEAN Integration Fund (JAIF). It has 3 Phases: Phase 1 was the ASEAN Planning Conference held last April 2014, and the third phase is the Terminal Impact Evaluation to be held on 2015. The conference aimed to develop the capacity of the government to implement sufficient and quality comprehensive programs for PWDs through a technical cooperation among ASEAN Member States (AMS) on best practices on the implementation of comprehensive programs for PWDs on the following areas: Advocacy, Resource Mobilization, Institutional Development and Legislations and Policies. The three-day conference was attended by 3 to 4 delegates from the 8 AMS namely Brunei Darussalam, Cambodia, Indonesia, Malaysia, Myanmar, Philippines, Thailand and Vietnam. The delegates represent the government agencies, Disabled People’s Organizations (DPOs), and NGOs. Each of the member states presented the existing programs and services for PWDs their country has developed and implemented. Included in their presentations are the identified issues and concerns pertaining to the quality and sufficiency of the programs and services for PWDs in their respective countries. The Philippine Report was delivered by the acting Executive Director of the National Council on Disability Affairs (NCDA) Ms. Carmen Zubiaga. It is good to note that there is an increasing opportunities for PWDs in the Philippines to actively participate and advocate for themselves in the economic and social life. This happens through the formation and empowerment of the federations of PWDs; and with the adaptation of Community Based Rehabilitation as a strategy for rehabilitation, poverty reduction, and equal access to basic services and inclusion of PWDs and their families in rehabilitation. All the 8 AMS have presented statistical data of PWDs according to different types of disability but were evaluated to have limited reliability and credibility and are not internationally comparable. One factor to the comparability of data is the absence of a standard definition of disability (i.e. country specific and ASEAN level). To address this issue it was advised that there must be a standard definition of disability and the different types of disability to ensure a common understanding of disability across the ASEAN Region. The member states affirmed the presence of policies that protect the rights and welfare of PWDs and the existence of a variety of programs and services for PWDs in their country. All provides skills training for employment for PWDs. Each also implements Community-Based Rehabilitation Programs with different focus. The Philippines, Thailand and Cambodia have programs on organizational development and management of Disabled People’s Organization (DPOs). And the Philippines and Thailand strengthens these DPOs through leadership training. For the Philippines, the ASP's Early Detection and Early Intervention Program of Autism was mentioned as one of the programs to achieve goal number 5 of the Incheon Strategy. DSWD spoke about EDPID (Early Detection, Prevention and Intervention of Disability), which according to Director Margarita Sampang (Bureau Director- Protective Services Bureau, DSWD) can include ASP's EDIP for Autism since their program is not addressing this particular condition. Some of the issues raised were (a) limited understanding of government (especially local government officials) and other stakeholders on the social perspective in looking at PWDs (b) limited knowledge on legal frameworks that governs PWDs; (c) limited capacity of agencies and stakeholders in undertaking research on PWDs, managing and consolidating DPOs for advocacy work and resource mobilization (d) government’s limited fund support for PWD programs; (e) lack of a national government council to monitor and evaluate PWD programs as in the case of Indonesia; and (f) absence of monitoring and evaluation instrument to evaluate PWD programs. Another concern raised is the limited, if not lack of, programs and services for children with disabilities (CWDs), more so for those with non-apparent conditions. This is true for almost all the AMS who are present in the conference. Among the delegates only Malaysia was able to present a significant number on children with disability under the category Learning Disability which has their highest number of PWDs - and all are in school since the government runs 98% of the school system and only 2% are privately owned. Common hindrance to successful implementation of policies, programs and services among the different states is the lack of funds and the need to further educate the people about persons with disability. To achieve the full realization of the rights of PWDs and to implement the Incheon Strategy in the Asia and the Pacific Decade of PWDs (2013-2022) the United Nations Economic and Social Commission for Asia and the Pacific (UNESCAP-Secretariat) is promoting the ratification of the UNCRPD. Among all the AMS, it is only Brunei and Vietnam who are still in the process of ratifying the UNCRPD. ESCAP”s mandate is to foster cooperation among its 53 members and 9 associate members and it provides support towards an Inclusive, Barrier- free and Rights - based Society for Persons with Disability in Asia and the Pacific. Have we not entered the door of this rare opportunity we would not be able to share these information. It was indeed an overwhelming privilege to represent the Autism Society Philippines and to be among the four delegates of the Philippines. Being young in this field of advocacy, this is a much welcome learning opportunity. And we certainly have learned and understood a lot of new things which enhanced our capacity to serve the disability sector. About the contributors. Joy Ofrecia earned her Master’s Degree in Special Education from Angeles University Foundation. She conducts orientations and trainings to parents and professionals on autism. and is the current president of the Autism Society Philippines City of San Fernando Chapter. Teacher Joy finds her fulfilment in her role as an advocate of autism, an instrument to empowering parents of children with special needs and a hands-on mom to a teenage boy on the spectrum. Dr. Anawi A. Tolentino is the Chapter President of ASP Hagonoy, a practicing physician in the field of internal medicine and a hands on Mom to her 18 year old son – Jandell. She is also the administrator of the Supportive Parents of Hagonoy Children with Disability (SPHC) Center whose programs are centered on parent empowerment and providing learning opportunities for CWD.